You heard a tale of woe — cornerstone khakis now too baggy to wear that must be replaced — last week. 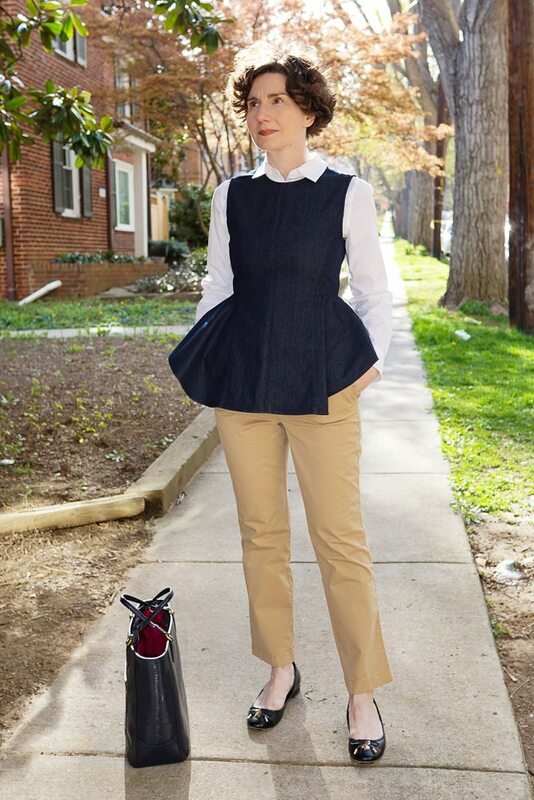 The search for good khakis is probably, like the search for the perfect white blouse, a lifetime endeavor that never really stops, but rather intensifies and wanes as necessary and appropriate. Here at Directrice Global Industries LLC, we are in intense search mode. I am rather taken with these khakis from JCrew. If they were full length, and not slightly cropped, I would buy two pairs, kick back, and rest for a few years. But they are cropped, and therefore not fulfilling all of my needs. 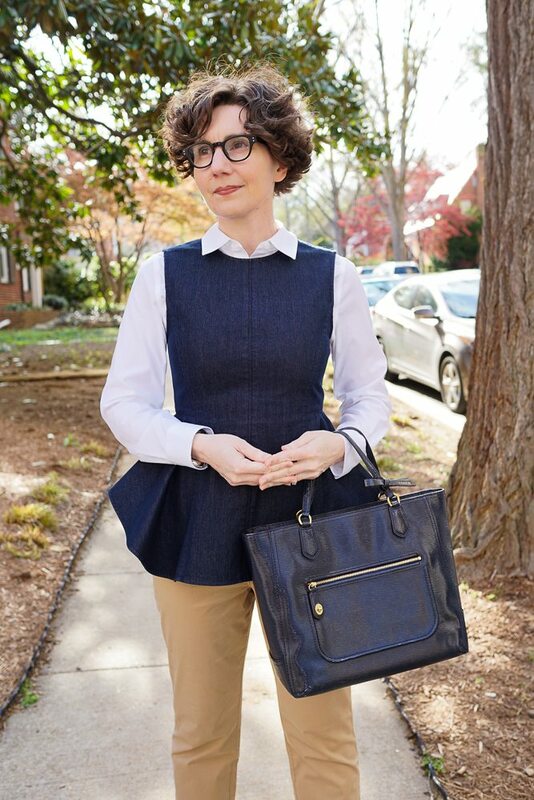 For reasons that I cannot fully explain, I feel that the cropped length requires a waist defining top, which could be a blouse, jacket or fitted jersey. This sleeveless denim top looks smart over a long-sleeved white blouse, doesn’t it? 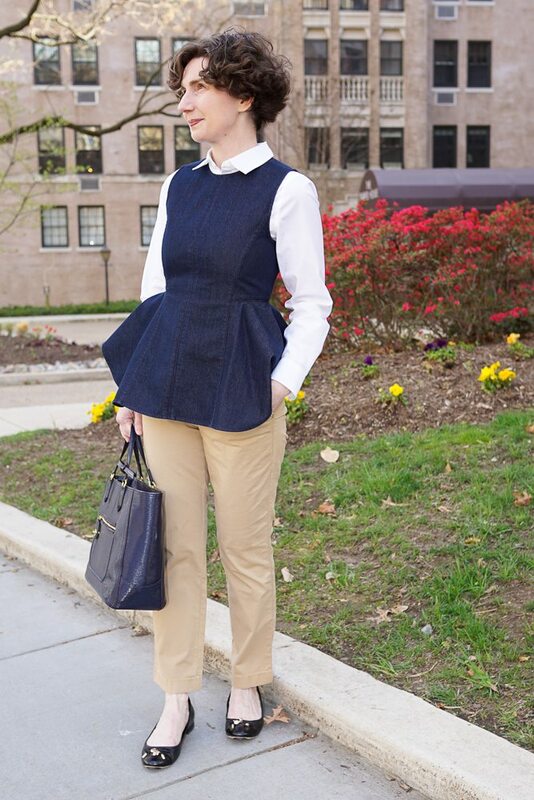 The peplum on this Theory top is longer and fuller in the front than in the back. That seems strange to me — like an inversion of universal principles of proportionality — but perhaps it is not my place to question this design. Who am I to gainsay Theory? 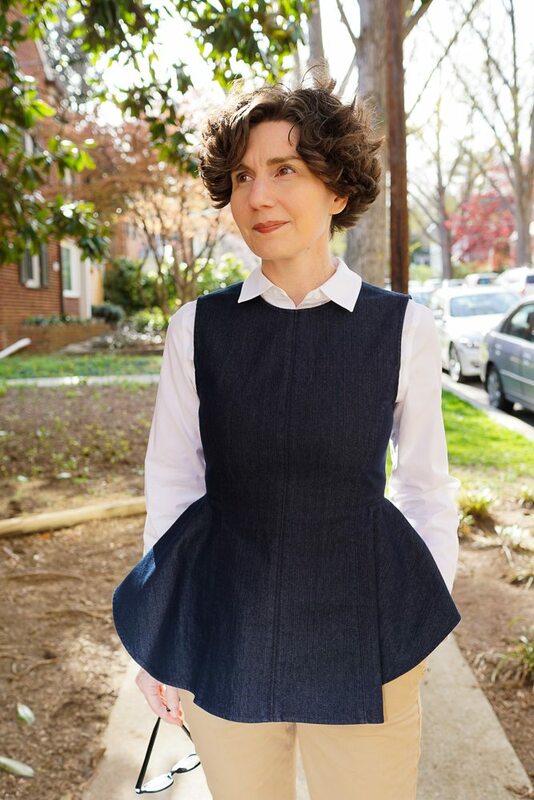 Looking at this top in profile, I realize that it would look most charming with a white blouse that was as long in the back as the denim top is in the front. But the blouse I have works well enough. 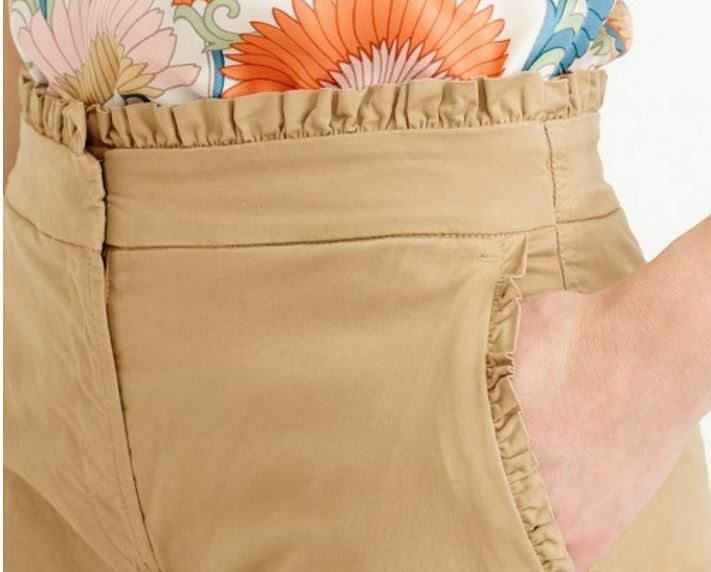 Here is a sad fact: The cutest feature of these pants is that they have a little ruffled trimming along the slash packets and waistband. 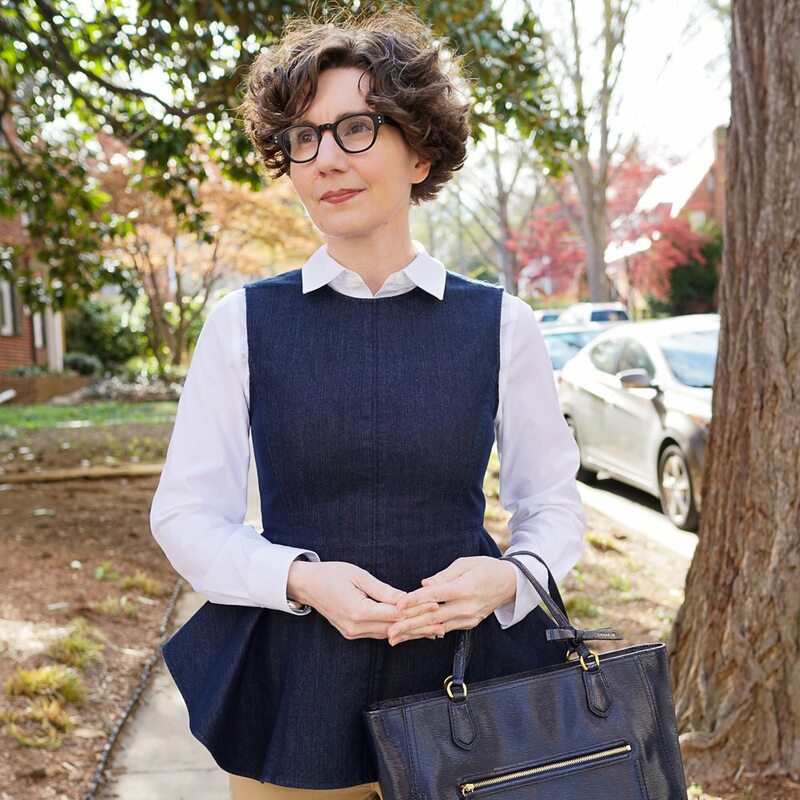 But because I rarely wear my blouses tucked in, the trim will not show. Now back to the low-high profile, because I just cannot let it go. What is the purpose, the inspiration? It this a modesty panel? A . . . codpiece? Is it simply the product of a designer’s mandate to make something different regardless of whether it is better? One final note: A black bag would have been a natural choice here, but I like the glossy navy tote, which looks so pretty with this dark rinse denim. If you bought the regular pant, the inseam is 27″. They also have it in tall, with a 30″ inseam. Would that be an acceptable length? I feel so foolish, Elbe. Yes, a 30″ inseam would probably work. Such a good idea, right there on the page and I didn’t see it! Unfortunately, the tall in khaki is now sold out. Those khakis look great on you and suit you perfectly. I say the world needs more cropped pants, not less. (Or is it more, not fewer?) Enjoy! 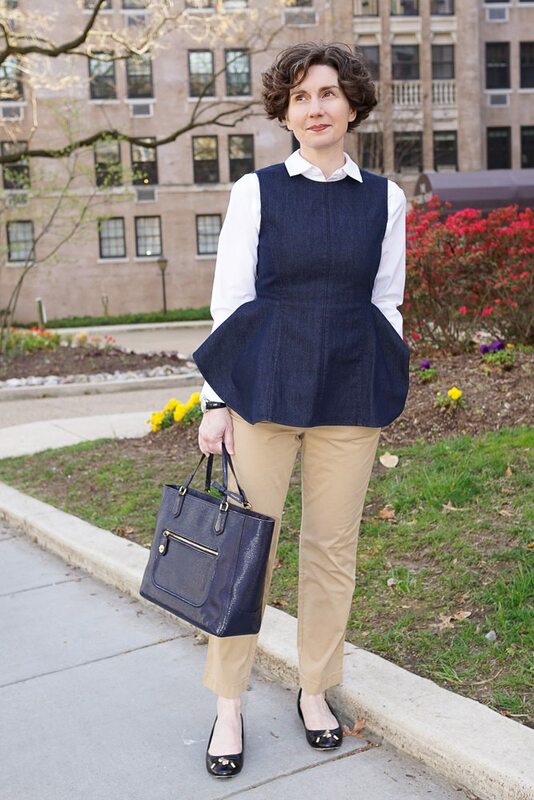 Black with navy are like the sound of nails on boards for me, so I love the navy tote with the denim. And would love even more if the black shoes were swapped for a brown pair, chocolate or tan, either would work I think. I also love the effect of the school-girlish upper-half with the feeling of a military uniform invoked by the khaki for the bottom half. The proportions of the individual pieces may be a little quirky but they all come together perfectly. Nothing makes me feel as leggy as an ankle-length pant. And it’s hard for me to look leggy, since I’m 5’1″. As a 5’10” curvy goddess, I will say these pants would never be allowed into my apartment. Too short! Plus, the dreaded side pockets! However, looking at your photos, I am struck by another factor — skin tone! 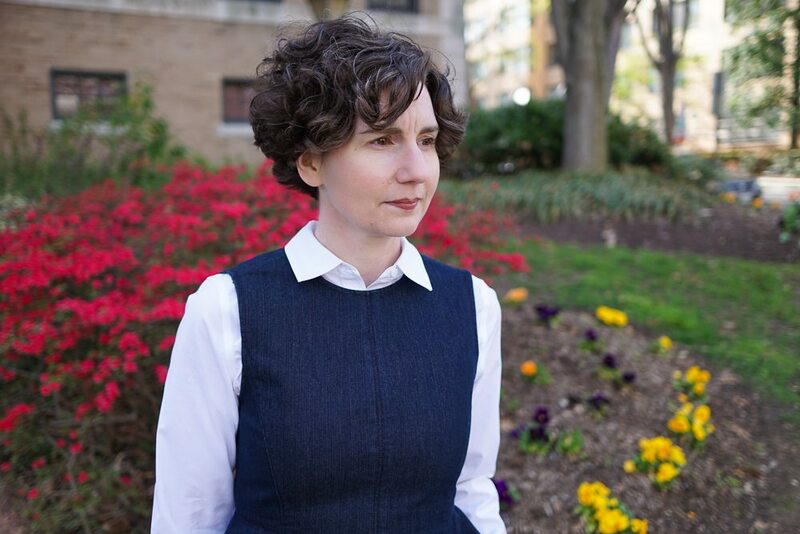 I have, without knowing it, been accommodating my very pale skin and the need for contrast. I think Caucasians in khakis run the risk of looking naked from afar. The glasses make me sing! And the top has an apron-like front and I believe you have a strong penchant for apron-like garments. That is the natural conclusion.